At Olmstead, we have a singular business focus: the asset management industry. We help our clients define a business-driven data strategy and then leverage and transform their existing data capabilities into a competitive advantage and efficient business accelerator. We offer years of data expertise coupled with the latest data technology research to craft a strategy and data platform solution to meet your unique needs. A well-built data platform with governed, high quality, and readily available data is the engine for a data-centric and data-driven asset manager. Read below to learn more about the consulting services Olmstead offers in support of our clients’ Data Management initiatives and their journey to data-centricity. Is your data strategy in alignment with your business strategy? Is the “business impact” of your data platform causing you to struggle to just “operate” or efficiently enabling you to grow through mergers, create unique products, and find Alpha? Olmstead helps asset managers define a business-aligned data strategy and then puts it to use by providing an Enterprise Data Strategy Assessment and our proprietary Olmstead Data Impact Model to evaluate your organization’s entire data platform including data governance, data architecture, master data management, data quality, and data analytics’ capabilities. Improving data capabilities will help your firm make better decisions, identify risk, execute strategy, create better products, and improve overall efficiency. Is your firm ready for your next large data-intensive initiative? Client Reporting, Sales Enablement, Middle Office outsourcing, are examples of these data initiatives. Chances are, you are not. Olmstead helps our clients assess their Data Readiness and then prepare them for successful data initiatives. Olmstead and industry vendors see well over 25% of all data initiatives are delayed due to data gaps (consolidation, completeness, quality, availability, etc.). Olmstead’s Data Readiness Assessment tool is used to conduct a point-in-time assessment of the readiness of your data for a planned system implementation. Outputs include a scorecard for all data in scope, ranking of key implementation data risks and proposed mitigation tactics. Click here to learn more about how Olmstead's Distribution Data Model and Data Service Layer provides an accelerated Client Communications implementation. Your IT systems should be enablers not drivers. We work with your technology stakeholders to ensure your business strategy drives and aligns with the future state Data Architecture strategy. Our experts fully understand the flow of investment data from front office through distribution. This end-to-end view ensures success of data initiatives and reduces time to delivery. Olmstead advises on optimal architectures that leverage the best of traditional relational platforms to the latest innovations from cloud and big data platforms and then help select and implement third party systems. 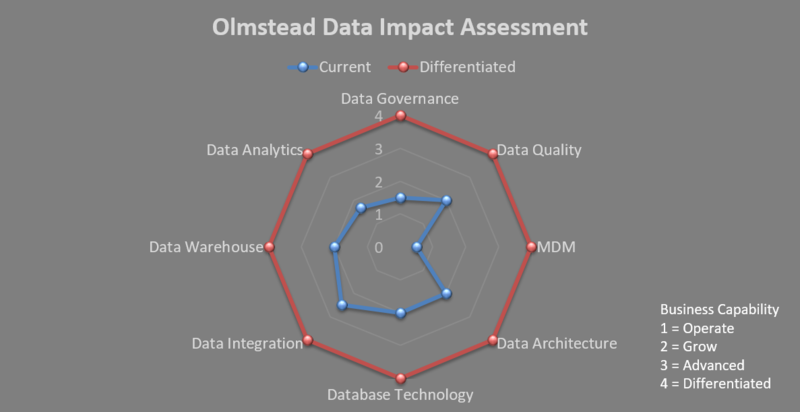 Olmstead provides an Enterprise Data Strategy Assessment and our proprietary Olmstead Data Impact Model to evaluate your organization’s entire data platform including data governance, data architecture, master data management, data quality, and data analytics’ capabilities. In conjunction with our Enterprise Data Strategy Assessment, Olmstead will design and implement an optimal technology architecture including an Enterprise Data Warehouse and business functional Data Marts that leverage relational data designs and/or the latest cloud and big data, schema-on-read solutions to meet your unique business objectives. To accelerate design and development, Olmstead has pooled 20+ years of data architecture experience and has created the Olmstead Distribution Data Model that is used as a blueprint to guide your data architecture modelling initiative. We constantly test and refine our data model in our AWS Lab. Mergers & Acquisitions, Outsourcing Investment Operations, Consolidating IT systems, and moving to a cloud-based solution provider all have one thing in common – a data migration requirement. We will leverage our tools and expertise to ensure your data migration is well-planned and executed. Olmstead’s Data Readiness Assessment tool is used to conduct a point-in-time assessment of the readiness of your data for a planned system implementation. Outputs include a scorecard for all data in scope, ranking of key implementation data risks and proposed mitigation tactics. Mastering data is an essential data capability providing the “single source” of accurate data in your data platform. Olmstead will apply our proven framework, use cases and knowledge to efficiently lead your team through a vendor selection process from RFI through vendor scoring and contract negotiations (if desired). We are vendor agnostic and work with the industry’s leading solution providers. Our targeted systems experts have over 20+ years' experience with leading MDM solutions. We will provide data analysis, business analysis, project management and implementation support for your system implementation. Our team has worked extensively with the leading native and cloud-based providers. From passive reporting, canned reports and dashboards to visualization, predictive decision making, and machine learning, your firm needs the right tools and flexible data sourcing to compete in today’s data-driven industry. Olmstead maintains an enterprise view of data analytics to ensure the right tool is used for the right user and use case. Our data experts successfully guide firms in selecting and prototyping dashboards, reporting and data visualization tools, data lakes, and ‘python' vs. 'R’ architecture and platform selection. Whether your firm is implementing a new Performance system, Client Reporting solution or consolidating Trading Platforms into a "hub", our data analysts will help ensure data requirements are fully vetted and documented to mitigate implementation risks. Our experts rate your firm's readiness to successfully establish a data governance framework using a tool compiled based on experience and multiple client engagements. The primary deliverable is a readiness scorecard and suggested remediation plan. Whether you choose an internal build or implement a third party data governance tool such as Collibra, Infogix, Erwin, Informatica or custom built solutions, Olmstead can provide the required skills and experience to map, configure and migrate your data, metadata and lineages. Olmstead has created a unique data platform assessment tool we call the Olmstead Data Impact Model. 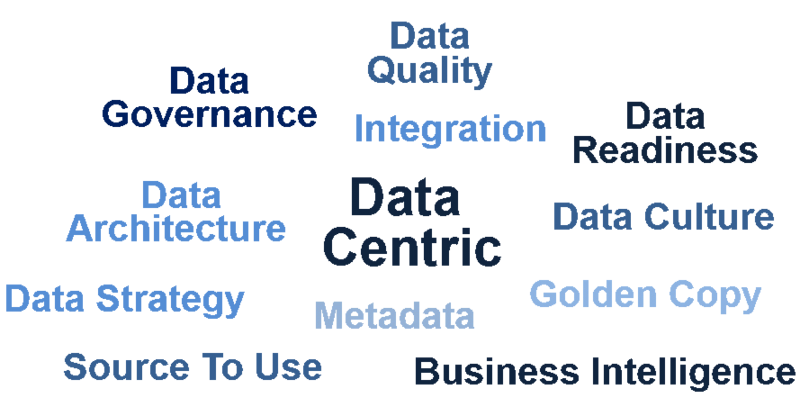 We identify improvements, opportunities, and recommendations across 8 essential data capabilities to reduce data inefficiency and increase business performance. We assess the “impact” your current data platform is having on your organization and recommend strategic, effective & pragmatic solutions to lower what we call your “Data Tax." What is the “impact” of my data platform on my business performance? Is my business strategy aligned with my technology and data strategy? How do we best manage data lakes across various analytics and data science teams? Should we continue to build a relational enterprise data warehouse or leverage advances in cloud-based, big data platforms? Is my data platform adequate to meet the needs of my next data initiative? For risk management and compliance, how best can I quickly aggregate data sources? How can data science and our data platform help create the optimal Prospect & Client User Experience? How do we maintain control of our data if we outsource our operations? How can we implement data governance in a manner that our organization can embrace? Do our internal and external clients truly want ‘anytime, anywhere’ access to their data? Olmstead is guiding a mid-tier investment manager's Portfolio Analytics team through the design and selection of a data warehousing solution with the end goal of automating and scaling their client pitch books and enhancing their client reporting capabilities. Olmstead has established an Agile methodology, including new processes and new tools (Jira, Symphony, BOX). Olmstead has lead the project kick off, educated the client, and coached the client throughout the process. Our team has managed the Agile process, including building and managing Kanban Board, Sprint Planning, Sprint and Story management, and daily scrum meetings. The project has also included Resource planning and management, resulting in burn rates and load balancing reports. Our Client had spent five years implementing new solutions for areas including trading, accounting, collateral management, performance and attribution. Each new solution created a new "island of data" for the business which resulted in additional complexity in the environment and confusion about which data to use or trust. Olmstead was engaged to design and manage the implementation of a strategic data management platform and data governance program. The approach introduced an enterprise data architecture coupled with the rollout of a comprehensive data governance program and an integrated data information access portal. Olmstead was asked to evaluate the scope of effort that a large Investment Management firm required to comply with the October 2016 SEC Modernization Act requiring RIC's to provide enhanced reporting and disclosures beginning June 2018. Olmstead's approach included conducting an "As-Is" assessment of their data environment including the IT architecture, data flows, Operations and Reporting. Olmstead then worked closely with IT and business stakeholders to define a future state business and IT architecture to support the new reporting requirements which surfaced gaps versus current state. We also delivered a detailed N-PORT and N-CEN data gap analysis down to the field level specific to the client. The gaps were used to build a roadmap and supporting resource and cost estimates which enabled the client to quickly seek executive approval to begin the project, without risk of delays and limiting risk of meeting their regulatory deadlines. Do You Have A Data-Centric Organization? 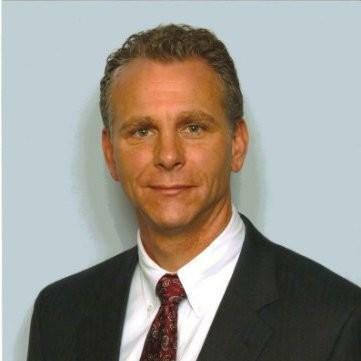 Ed manages Olmstead's Data Management and Analytics consulting services. Ed is a proven leader with over 20 years' of demonstrated success guiding asset managers with very large and complex technology transformational initiatives. Ed offers clients a unique combination of business strategy, deep technology expertise, and creative solution development spanning front, middle, and back office through distribution. Prior to joining Olmstead, Ed was Chief Architect of HIMCO and the Head of Strategy, Innovation, and Planning for Invesco. In his career, Ed has designed and built many front office applications, rebuilt entire investment management data platforms, delivered innovative predictive analytic solutions and is an expert in technology solutions for data analytics, quant, data warehousing, investment research, data governance, data mastering, and infrastructure. As a business strategist, Ed combines a thorough understanding of the investment management business with in-depth computer science and technology innovation solutions to best guide senior business leaders to maximize the benefit of technology spending to accelerate business strategy. Investment Management success can be correlated to effective use of data to make decisions, Ed is passionate about helping our clients by leveraging and transforming their existing data capabilities into a competitive advantage and efficient business accelerator. Technology advances in big data, predictive analytics, data lakes, and AI are rapidly changing the Investment Management industry and Olmstead is in a unique position to enable success with our clients. Well-built data platforms with governed, high quality, and readily available data is the engine for a data-centric and data-driven asset manager.